Except, this street did have a name. 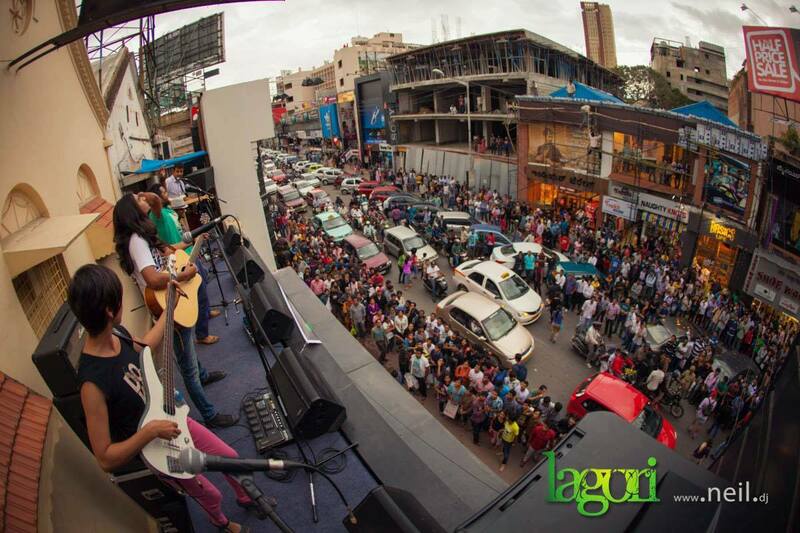 Our very own, beloved Brigade Road in Namma Bengaluru. The crowd of people and vehicles, the nervous cops and the gush of wind atop the Lee Store terrace had a very surreal similarity to the U2 anthem video. But this was no U2. This was no rooftop in Los Angeles. This was us — Lagori. To be completely honest, we had NO idea what to expect. All we could do was gear up over the few days leading to the 28th of July, 2013 — a date that will stay etched in our hearts forever. We focused on planning our sound setup, discussing our “look” (which always used to flop, but LEE saved our graces by being our official clothing sponsors), and wondering how not to throw up from the thrill/tension/anxiety of it all. And finally, the big day arrived. What normally would have been a leisurely Sunday had all of us up before sunrise, gnawing on our nails and waiting. The hours went by at snail’s pace, with us running about capturing snippets for the music video. Neil and Sladen tried to capture our ‘normal’ moments before the gig, to try and make us look like rock stars. I think we looked more like the Simpsons for a while. Eddie lost some of his hair due to anxiety, (what with the Rain Gods teasing us with random showers), Tejas and Vinyl forgot to have lunch (a first in all their years of existence! ), Geeth was wondering if he might take to meditation after all, and I was getting a sugar high from candy overdose. And then it was TIME! And that’s when it started to sink in that we could actually pull this off! We are actually going to be the first band to play *on* what could easily be the busiest street in our city. With scores of people and vehicles going about down below, as they would everyday. No, we still didn’t know what to expect. But as we walked up the steps to the steep LEE terrace, we knew we wanted to take your breath away with the AUDACITY of what we were about to do. We wanted to show you that in over the short two years we’ve been together, we have put our hearts and souls to get to this place. We wanted to show you just how passionate we are about what we do, and just how much we are willing to push it, to have our voices be heard. We wanted to blow you away. And then you guys blew us away. So many of you on the street, looking upwards, and singing every word of our songs till the Rain Gods told us to stop. The applause, the smiles, the overwhelmingly warm acceptance of what we were doing. You guys blew us away. You guys made us realise, with every sinew and tendon in our beings, the importance of that half hour on top of Brigade Road. Yes, we have amazing footage for our music video. But we have the most amazing memories of traffic standing still to listen to us sing and play our hearts out. As we got down after the performance, we were swamped with your hugs, and left speechless with your kind words. And as we sat down together as a band with our friends to call it a day, that’s when it began to hit us. The gravity of what we had done. And we felt so humbled.